Part of the #1 Doctor Recommended1 Brand for dry eye relief, SYSTANE® Lubricant Eye Drops has been clinically proven to reduce both the signs and symptoms of dry eye. Providing immediate, long-lasting moisture and protection, it's no wonder that SYSTANE® is preferred nearly 2 to 12 over other dry eye drops on the market. Available in 15 and 30 mL bottles and convenient 5 mL Pocket Packs, SYSTANE® Lubricant Eye Drops offers the relief you need to get through your day! Boric acid, calcium chloride, hydroxypropyl guar, magnesium chloride, polyquaternium-1 as a preservative, potassium chloride, purified water, sodium chloride, zinc chloride. May contain hydrochloric acid and/or sodium hydroxide to adjust pH. I couldn't focus on my work, due to my dry eye symptoms. 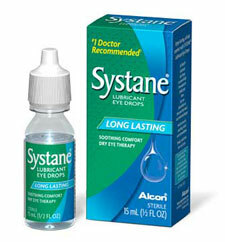 Fortunately, my doctor told me about SYSTANE® Lubricant Eye Drops.